German Import Limited Ediion – While the 2011 album Der Kalte Krieg was more a special passion of singer Honey, Tanzmusik für Roboter again is what everybody wants and what everybody needs – a genuine W:E album in all its glory, being released seven years after the last “true” album Chaos Total. According to the band itself, this is not only a milestone but their most important album at the same time, truly in the spirit of masterpieces such as Die Wunderwelt der Technik or Der Sinn Des Lebens. Expectations are high! Many of the songs of Tanzmusik für Roboter were produced exclusively using a changing sound source. “Mimikry” for example was solely produced on a “MB Simon” game device (anybody remembering?) while “Liebe der 3. Art” was brought to life on a Nintendo DSlite. Of course, the 5th band member called Commodore 64 can’t be missing here. Not only that this famous home computer actually wrote the lyrics to the track “Vielen Dank für die Information” (be surprised!!) – it also provided all the sounds of the pivotal dance floor hymn of the upcoming album, a song called “Gib mir meine Zukunft wieder”. 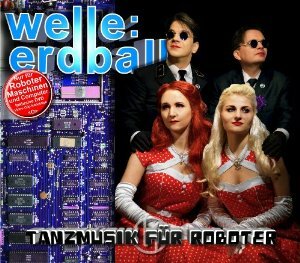 WELLE: ERDBALL style without a doubt! The limited edition not only contains 2 exclusive bonus-tracks, but the icing on the cake with the limited CD+DVD edition is a full video DVD containing all music video productions the band ever did for themselves and for close friends!